SABATON is a Heavy Metal band from Sweden, formed in 1999. The band has released six prior albums to date, and underwent some pronounced line-up changes in 2012. In fact, only vocalist Joakim Broden dates back to the founding of the band. “Heroes” is their seventh album, and contains ten new tracks. Lyrically, the band has always dealt with History / War and this new album is no exception. “Night Witches” opens the album. Musically it lies somewhere between traditional Heavy Metal and Power Metal, with a dash of symphonic type fullness. The track is swift and spirited in tempo, and very assertive on the edge of Joakim’s vocal prowess. They paint a picture of a vicious war type scene, where the galloping army of those on the righteous side, earn victory. “No Bullets Fly” is a bit slower in tempo, bet every bit as impactful. A melodious riff carries forth the purely contented vocal harmonies into a concisely enjoyable track. In “Smoking Snakes”, you can feel the Power Metal elements here bringing the song to life, in a progression of major key chords that build on top of one another. “Inmate 4859” is a bit slower, more grinding and powerful in its delivery. Intended despair is spiced throughout the track, while “To Hell and Back” has a nice, jovial, folky kind of feeling, featuring some recorder in the chorus if I am not mistaken. Here I am reminded of some blue skies and green pastures, perhaps moments before or after a great battle. The variety and innovation the band has worked into this album is momentous. “The Ballad of Bull” is just that, a piano laden lamentation of a tale or heroism, with grand crescendos and a feeling of accomplishment. “Resist and Bite” sees the pace quicken again, with thunderous riffs and an air of perilousness. “We will resist and bite” Joakim belts out, as the instruments carry forth a marching sound. “Solider of Three Armies” returns to that Power Metal type sound, with some background keys that shine in the absence of guitar and bass for short passages. Blissfully the chorus shines through, a grand statement. This is what SABATON does so well, hooking and selling you at every turn. “Far From the Fame” reminds me of older era IRON MAIDEN. It all starts with that riff based approach to the composition, and a strong, convincing chorus. “Hearts of Iron” closes the album in an elevated fashion, leaving the listener feeling both satisfied and victorious. I am reminded that traditional Heavy Metal is not dead, but very much alive. The massive line-up changes do not appear to have negatively affected the band at all. In fact, SABATON sounds as commanding as ever, and this album might very well be their best work. I thoroughly enjoyed each and every track here. They aren’t re-inventing the wheel, but an exceptional album doesn’t need to. The secret is making every song memorable, and refusing to put forth anything that isn’t your best. 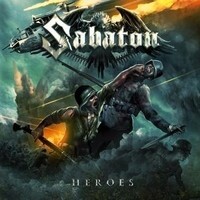 SABATON have accomplished this well and I highly recommend you pick this up.